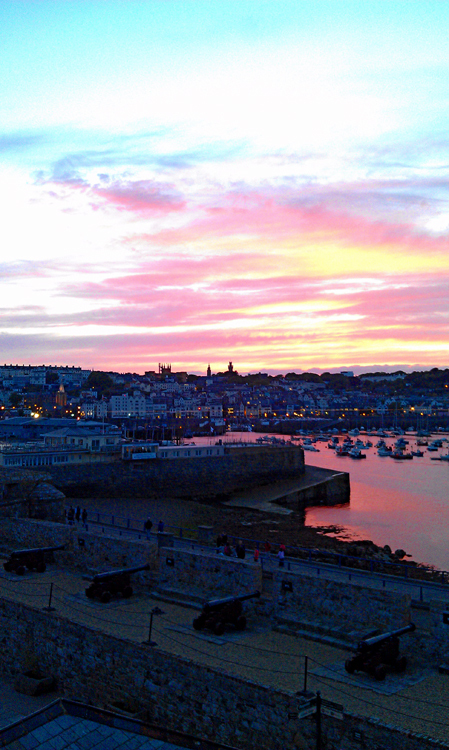 Okay, so I'm back at home and very much back to reality after my time in Guernsey. Or should that be "on" Guernsey? How big does an island need to be before you are in rather than on it? Semantics aside, I'll get on with the much-delayed business of reporting how the remainder of the weekend went, after the glittering showbiz of Thursday night. Friday was a day of preparation for me; I spent a few hours getting my notes in order and sorting the handouts for the workshop, reading through my book to decide which stories to read out, and generally chilling out in anticipation of a considerably more hectic weekend. In the evening, I had a lovely meal at La Perla, an Italian restaurant in St Peter Port, and afterwards walked over to Castle Cornet. The castle is one of my favourite "touristy" things to do on the island, and the novelty of visiting it in the evening added an extra level of enjoyment. 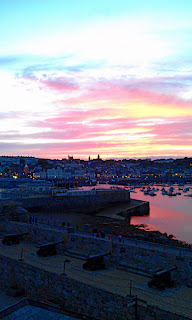 Particularly in that it meant I could watch the sun set over the town of St Peter Port, which - it has to be said - is a very attractive place (although my phone's camera struggled to do it justice). Saturday morning kicked off with a very interesting talk and reading from author Tim Binding. Tim has written several novels, both for adults and children, but the talk I went to focused on his Guernsey-set work, Island Madness. I started reading the novel a couple of weeks before I went, and even now I'm only about halfway through it - I'm just not getting enough time to read any more than a few pages at once. It's very good, and conjures up the atmosphere of Guernsey during the Nazi occupation extremely well. Tim talked about his inspiration for writing the book (essentially the photograph that now serves as the book's main cover image), the research involved in putting it together, and some of the perils of writing fiction. The main example he gave was in the opening chapter, where he talks about the damage caused to the Major's lawns by the local moles. Several years after the book came out, a Guernsey girl working at his publishing house calmly informed him that there are no moles on Guernsey. It's risky taking anything for granted, it seems. Next up was a dash to the cake shop and then back to the Hub to catch a poetry reading from Richard Fleming and Peter Kenny. The two of them go by the name "A Guernsey Double" and offer two different perspectives on island life. Richard is an Ulsterman who moved to Guernsey, and Peter was born and grew up on Guernsey and moved away. Their poetry revolves around themes such as the concepts of home, safety, travel, and many more. They have a book out, a back-to-back anthology of poems called The Boy Who Fell Upwards / The Man Who Landed. From the snippets they read and the reviews the book has garnered, it sounds well worth investigating. I'm hoping to pick up a signed copy next time I'm over, which should be later in the year. The last engagement of the day was an evening performance in the town church. Here, Olivia Chaney performed a fantastic set, showcasing her beautiful voice and musical talent on the piano, guitar, and harmonium (I think - it was something like an accordion, but more of a box). Olivia plays a variety of styles, from folk to operatic, traditional and more contemporary songs. She writes her own songs, too, and said she was putting an album of her work together. It should be worth tracking down. In addition to Olivia's songs and music, the winning writers from Guernsey's "Poetry on the Buses" competition read their work. I struggle a little with poetry sometimes; it's not a form that always 'clicks' for me, but most of the work was accessible even to a dullard like me, and it was great to hear the poets read their own work in the impressive setting provided by the church. I've run out of time now, so I'll leave Sunday's details for another day. I'll try not to leave it too much longer. Hi Guernsey Girl, nice to 'meet' you. I think for a first effort the festival was excellent. It seems to have gone very well, so fingers crossed they'll repeat it next year.